Louis Philippe I (6 October 1773 – 26 August 1850) was King of the French from 1830 to 1848 in what was known as the July Monarchy. He was the last king to rule France, although Napoleon III, styled as an emperor, would serve as its last monarch. 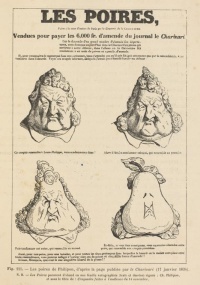 The famous 1831 caricature of Louis Philippe turning into a pear would mirror the deterioration of his popularity. Unless indicated otherwise, the text in this article is either based on Wikipedia article "Louis Philippe I" or another language Wikipedia page thereof used under the terms of the GNU Free Documentation License; or on original research by Jahsonic and friends. See Art and Popular Culture's copyright notice. This page was last modified 07:48, 15 February 2015.